After a long time I saw some cannelloni at Nakumatt. Before I got too excited, I rushed to the chiller section to check if there was any ricotta cheese and quickly grabbed it as there were only 2 tubs left. Bought the cannelloni and ricotta and was all excited as I was now ready to make my all time favourite, cannelloni. Lasagna, cannelloni, ravioli are some of my favourites. Making cannelloni at home is a bit time consuming as filling the tubes of pasta requires a bit of patience. I read in my numerous searches that filling it with an icing bag is easy, but they forget to mention that you have to be pretty skilled to use the icing bag! So my old method of pushing the stuffing from both ends of the tubes works for me till I master the skill of using an icing bag. 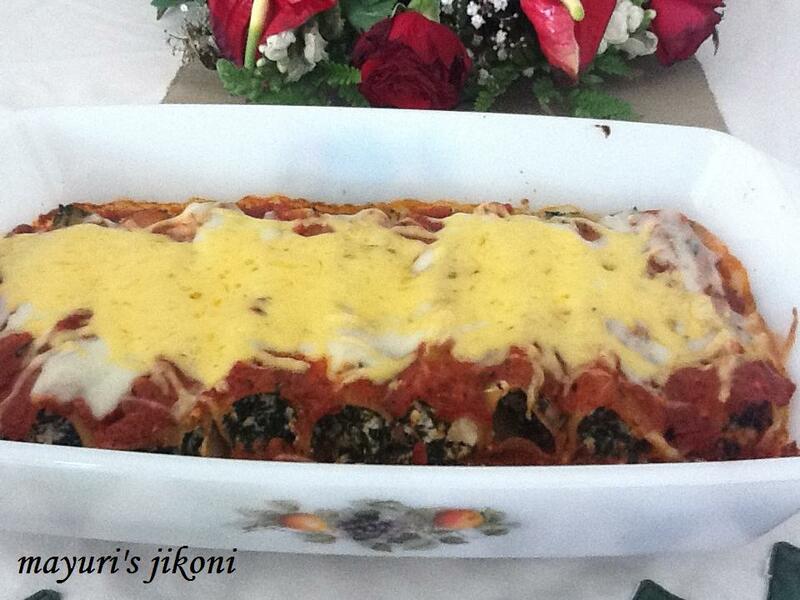 I prefer to use spinach and ricotta cheese as my filling as I tend to use a mixture of vegetables for lasagne. After you have soaked the cannelloni for the required time, make sure no calls, visitors or anything else disturbs you as the tubes will become too soft to handle. Add herbs and spinach. Mix and cook the spinach on high heat till it is just done and not overcooked. Add salt, pepper, nutmeg and ricotta cheese. Mix well and keep it on the side till required. Heat oil in a pan over medium heat. Add the onions and stir fry till they turn light pink in colour. Add garlic and stir fry for a few seconds. Add herbs. Add tomato puree, salt and sugar. Mix well. Cover the pan and let the sauce cook till it becomes slightly thick. Add pepper and mix and keep the sauce on the side till required. Soak the cannelloni in enough warm water for 10 minutes. Remove from the water and immediately start stuffing it with the filling. Pour some sauce over the base of the baking dish. Arrange the filled cannelloni in the tray. Spread more sauce over the cannelloni. Make sure you spread the sauce over the edges of the cannelloni. Top with fresh cream or white sauce. Cover the baking dish with a foil and put it in the oven. Bake for 15 to 20 minutes. Remove the foil and sprinkle the cheese over the cannelloni. Bake for a further 5 to 10 minutes or till the cheese melts. Mix the tomato sauce and fresh cream for a more creamier sauce. I used a mixture of mozzarella and cheddar cheese for the topping. If you like use white sauce instead of tomato sauce. Don’t make the sauce too thick. The water in the sauce is what will cook the cannelloni.